A few weeks ago, my friends and I gathered to celebrate our good friend Meaghan and her future daughter. I wanted what I wore to the shower to be a little bit dressy, but also a little casual. 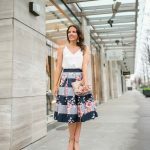 I knew this skirt would be perfect for the little bit dressy part, and that it was also a skirt I could easily dress down a bit. 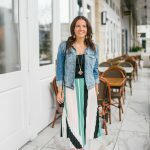 Pretty much my entire outfit was planned around this skirt. For the casual part of my outfit, I reached for one of my H&M tees. 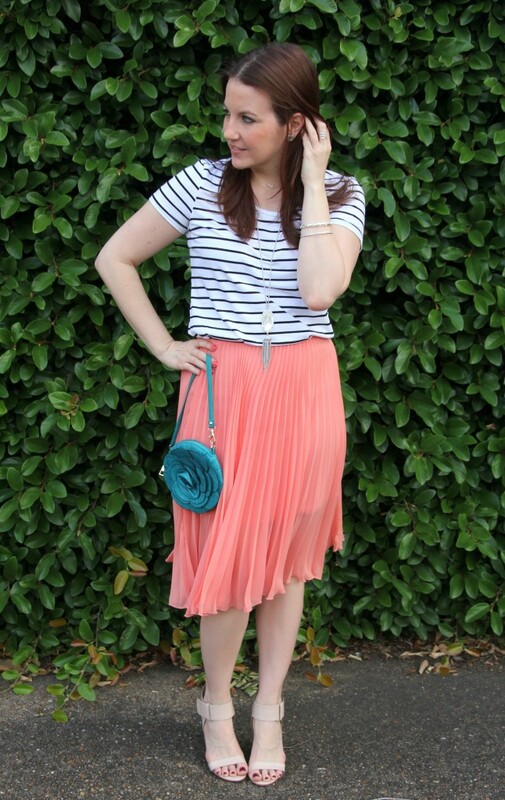 I really like how the thin black and white stripes pair with the pinkish peach color of the skirt! With my dressy casual ensemble ready, it was time to accessorize! I have worn this skirt with only gold so far, so I wanted to change it up a bit and pair it with some silver jewelry. I immediately grabbed my Kendra Scott Rayne necklace. I love how the white pearl color looks against the color of the skirt! I felt I needed one more delicate necklace, so I added in my infinity necklace from Wildbloom. It was the perfect length to sit right above the crew neckline of the shirt. Since my Rayne necklace and this skirt are both statement pieces, I kept my earrings and bracelets super simple. I opted for only a couple thin bangles, and my basic Kendra Scott studs. While digging through my purses for a clutch to carry, I found this old favorite from Sam Moon. 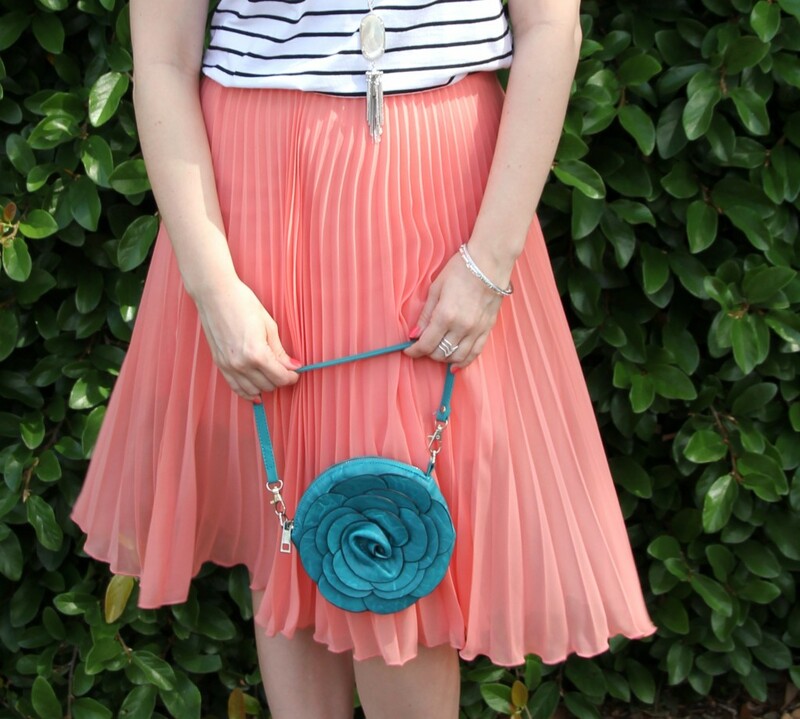 I love how the turquoise color pops against the pink of the skirt!! It provided the perfect compliment to my outfit! 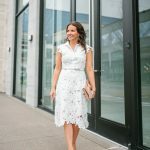 Perfect ensemble for a baby shower!! So fresh and pretty! Thanks so much for linking up! Such a pretty outfit, I love the 2 necklaces together, but my favourite thing is the bag – love the bag! This outfit caught my attention immediately! Coral-ish with black and white stripes? I’m THERE. And I’m loving midi-length pleated skirts like that. I need to add one to my closet! 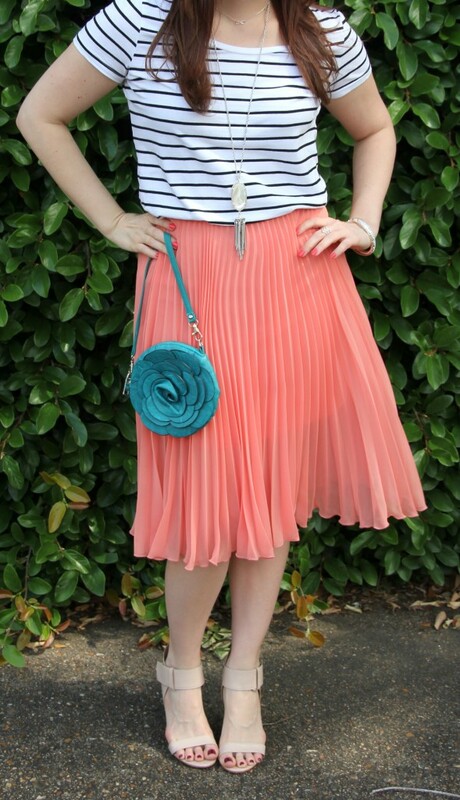 Such a pretty pleated skirt! I love that you paired it with a striped tee. That skirt is soooo sweet! 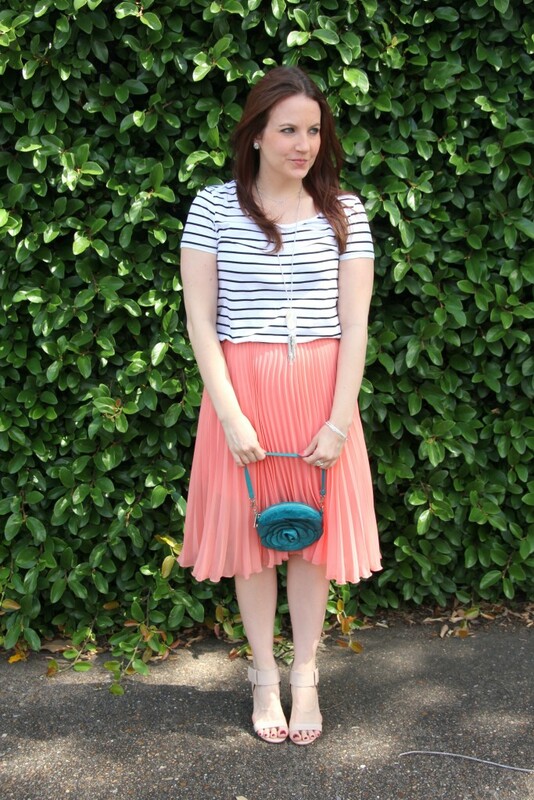 You paired it perfectly with the striped tee & cute clutch! I love the idea of making headbands for the new baby! 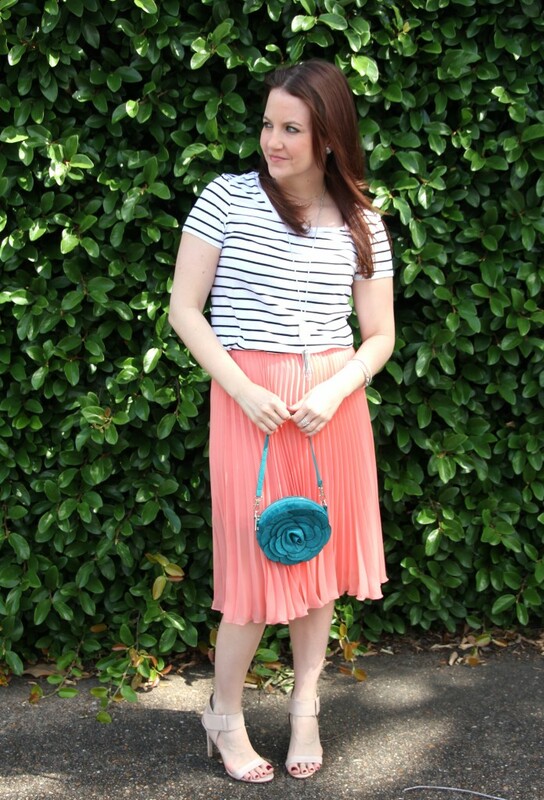 Thanks so much for linking up for Passion4Fashion this week! Have a great weekend. 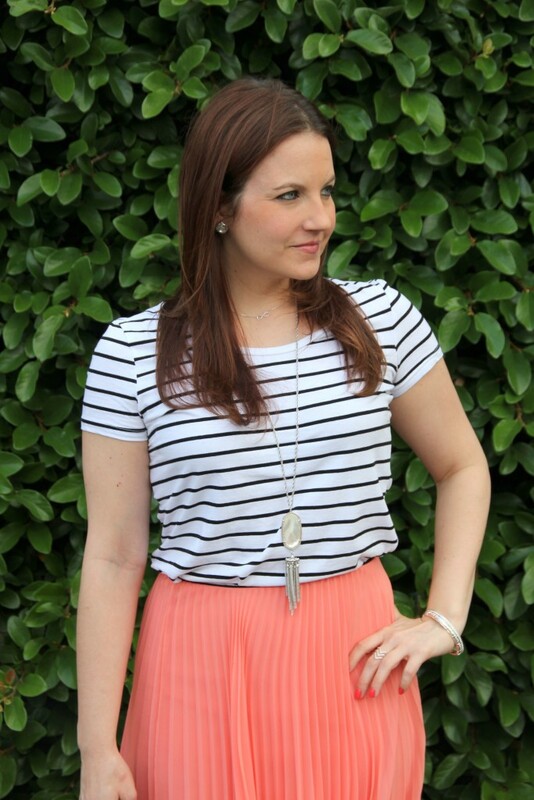 I love the pretty coral skirt and striped top! That bag is adorable too! I hope you have a great weekend! So cute!! 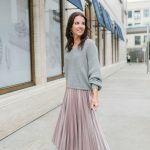 I’m such a fan of pleated skirts…this looks so great on you!